Someone with talent – I think it was British National Women’s Champion Helen Wyman – said that racing cyclocross was an apprenticeship. I agree with her, although I wish she had said how long the apprenticeship lasts because I’ve been racing cyclocross for five years and I’m still right at the beginning of the arc of learning. During that time, I’ve made loads of mistakes. I’ve done the wrong sort of training, used the wrong sort of equipment, prepared for a races badly and made every sort of mistake that it’s possible to make during a race. All other things being equal, the fittest person wins the race. Being fit isn’t enough though. 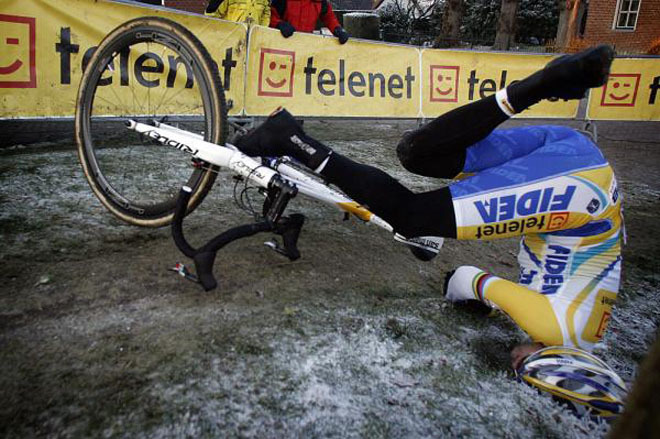 You have to be cyclocross fit. That means being able to suffer at or near your limit for up to an hour. It means going deep and putting in sharp digs of power and being able to recover quickly enough to dig again. And again. For an hour. Fitness is one thing. Knowing how to use it is another. If you know what your threshold heart rate is, you should be at it for all but the first minute or so of the race. 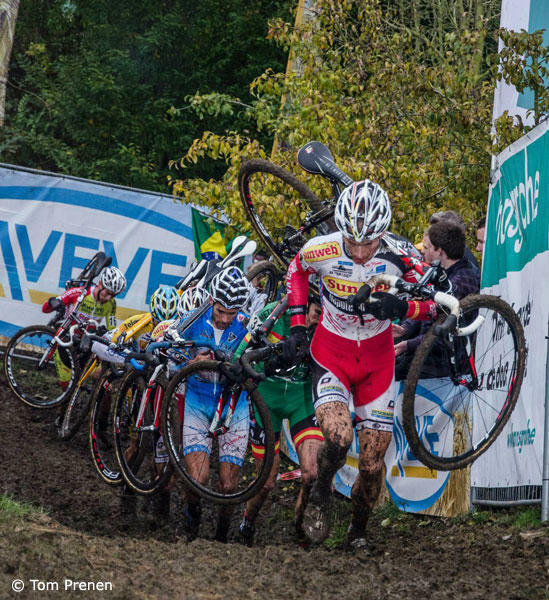 They say that the sprint in a cross race is at the start. Train to recover from a hard initial 30-60 second effort back to threshold. Your rate of perceived exertion on a scale of 1 to 10 should be :- 9 at the start, 8 for the duration of the race with digs of 9 when required. A one off 10 may be required at the end if you are sprinting for position. If you go below a 7 on a section that wasn’t freewheeling downhill, and you aren’t lying in a crumpled heap at the end of the race with a spittle flecked face, you weren’t trying hard enough. 3. Racing cyclocross is a skill. Being fit will only get you so far. You need to have a comprehensive list of skills which have to be performed flawlessly for lap after lap. You need to be able to corner efficiently, ride short climbs or adverse camber sections efficiently, dismount and remount your bike efficiently (from the left and the right), run over barriers, run up steps, shoulder your bike properly. The list is endless and perfection (in my experience) unattainable. Practice makes perfect. Find a piece of land which has the right type of features and practice until your strava ride map looks like the demented doodling of a small child. A road bike is only suitable for benign surfaces. A mountain bike can go anywhere but generally has at least front suspension and is forgiving to ride. A cyclocross bike is expected to go everywhere and is not particularly compliant to ride, so you need to ride your cyclocross bike all the time to get a feel for what it can do and how it handles. On road and off. In all types of conditions. If you become proficient at racing cyclocross and want to further your success, buy a tubular compatible wheelset and cyclocross tubular tyres. Experiment with tyre pressures on different types of surface. The improvement in compliance, grip and therefore lap speed really is a game changer. Simple, but perhaps the most overlooked. Arrive at the venue fresh, with a bike that you have already checked to make sure is working properly. Arrive in plenty of time to register for your race, ride the course a few times, go back to the car to tweak the bike/ kit/ tyre pressures, ride the course a few more times and do a warm up appropriate to the race that you are about to do. You will invariably need twice as much time as you think you do. Be aware of what is going on around you in the race. Work out what you are good at and what your weaknesses are and how that fits in with this particular course. On your ride around the course before the race, think about where the good passing places are and how the racing line may change as the course cuts up. If you are technically proficient, you may want to overtake competitors before a singletrack section and force a gap behind you. In dryer flatter conditions, it may benefit you to sit in a group to recover, or work with a group to bridge up to riders in front or increase the gap to riders behind. Cyclocross isn’t just about bike racing. It’s about going the fastest you can at any given time in any given situation. There aren’t any prizes for riding as much of the course as you can. Constantly assess the course and the riders around you to determine whether it is faster to ride a particular section or get off and run. Don’t be governed by what the rider in front is doing. Don’t be too up his chuff on a climb, because he might bobble and stall. His loss of momentum will become your loss of momentum. Watch the Pro’s racing and notice how their dismounts and remounts are so seamless that you often have to rewind and fast forward a couple of times to see when they did it. Every so often, during a race, you might just not be feeling at your fittest or you might make a stupid mistake which costs you time. In both situations the riders who you were racing with will dance away from you. You may be dispirited and in pain. Never give up. Try and bridge back to them or keep going at a sustainable pace. Riders in front may crack or fall. You need to make sure that you are able to take advantage of it if they do. People who are at the limit of their mental and physical capabilities can make mistakes, or crack. Assess the riders around you. Are they at their limit or composed ? comfortable on the bike or all over it ? How do you feel in comparison to how they look ? Could they stay with you if you attacked ? If you attack with confidence and get a gap of 4 or 5 seconds, it may be enough to break their spirit. Conversely, if they attacked and you were able to winch yourself back up to them, that might break their spirit. Or at least put them off doing it again. 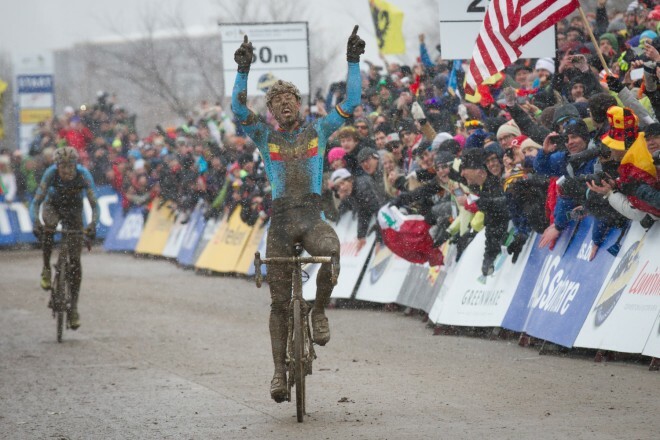 If everything I’ve written sounds a bit serious, don’t forget that racing cyclocross is supposed to be fun. The atmosphere and camaraderie at races is wonderful and the heady mix of endorphins and adrenaline after the race always makes for lively discussion. You have actively made the decision to race rather than go for a gentle ride. You have therefore voluntarily put yourself under a degree of physical strain and mental anguish. Embrace the pain, Enjoy the suffering. It all makes sense.